In 1981, a counselor introduced me to the I Ching when he used it during our sessions. 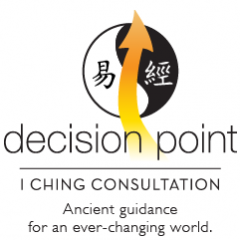 During these encounters, I experienced firsthand the I Ching’s wisdom and utility for making decisions regarding my small business. Under his guidance, I learned that year how to consult the I Ching myself using the Wilhelm/Baynes and other translations, and soon developed my own personal relationship with this ancient and multi-faceted oracle. During my first decade of practice, I frequently consulted with the I Ching regarding business matters as well as personal concerns, and began conducting readings for friends and clients. My understanding of the I Ching and its history deepened when I began graduate studies at the California Institute of Integral Studies (CIIS) in 1990. There, I studied the I Ching and other aspects of Chinese philosophy privately and in classroom settings with noted Taiwanese scholar and author Dr. Yi Wu. During the course of this study, I became familiar with Dr. Wu’s own translation of the I Ching, which provided direct concordance between the original Chinese characters and English words. He also instructed me in the accompanying Ten Wings commentaries, and their crucial importance for understanding the philosophy and cosmology of the I Ching. As a result of my studies with Dr. Wu, I not only gained an essential Chinese perspective on this ancient book, but also came to appreciate its key role in the development of various Chinese philosophical systems, including Taoism and Confucianism. During my time at CIIS, I also deeply immersed myself in the work and theories of C. G. Jung and others of the Jungian school, and learned how Dr. Jung and his followers promoted the practice and study of the I Ching in the West. I eventually devoted my dissertation, “On Receiving Unexpected Money: A Theoretical and Empirical Exploration of Anomalous Mind–Matter Interactions within Archetypal Fields,” to a study that would advance Jung’s synchronicity principle, a principle that was partially inspired by his work with the I Ching. Since receiving my PhD, I have presented seminars on the I Ching in various settings as well as conducted readings for many people on the topics of business, finance, careers, relationships, and health. I have also continued to use it in my life to guide decisions related to pursuing a career in social science research and health program development, beginning and managing relationships, buying a home and making other financial decisions, and, of course, launching Decision Point. I look forward to sharing my deep, abiding love for this wise oracle with you! When facing a promotion opportunity at work that involved relocating and working under a different management team, I asked the I Ching (with Mary Kay’s help) and received an easily understandable response that helped me make the right decision. I accepted the offer, and am still glad I did! .